Having enchanted readers on two continents with Balzac and the Little Chinese Seamstress, Dai Sijie now produces a rapturous and uproarious collision of East and West, a novel about the dream of love and the love of dreams. 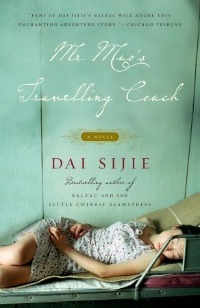 Fresh from 11 years in Paris studying Freud, bookish Mr. Muo returns to China to spread the gospel of psychoanalysis. His secret purpose is to free his college sweetheart from prison. To do so he has to get on the good side of the bloodthirsty Judge Di, and to accomplish thathe must provide the judge with a virgin maiden. This may prove difficult in a China that has embraced western sexual mores along with capitalism–especially since Muo, while indisputably a romantic, is no ladies’ man. Tender, laugh-out-loud funny, and unexpectedly wise, Mr. Muo’s Travelling Couch introduces a hero as endearingly inept as Inspector Clouseau and as valiant as Don Quixote. I read Balzac and the Little Chinese Seamstress pre-blogging and really liked it. When I saw that the Chicago Tribune blurbed that "fans of Dai Sijie's Balzac will adore this enchanting adventure story," I went ahead and bought it. Unfortunately, I didn't find this novel nearly as enjoyable as Sijie's earlier work, but I think it's me and not the book. 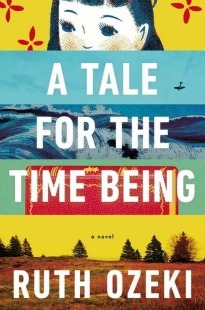 It reads beautifully, but I had a hard time connecting with the characters and the plot. I found my attention wavering every 15-20 pages and had a hard time getting pulled in. If the novel wasn't on the shorter side at under 300 pages , I probably wouldn't have finished it. The majority of the novel follows Mr. Muo as he searches for a virgin to give to a judge in exchange for the freedom of his college sweetheart, who was accused of selling pictures of people beaten by police. In his quest Mr. Muo finds himself in one absurd situation to the next, and without knowing it, this journey becomes one of self-transformation. His return to China, and his quest to find a virgin, proves to be harder than he thought, as it's modernization and desire for development has transformed the nation on a social and political level. His search for a virgin was not helped by demographics: the majority of the generation among whom the virginal were mainly to be found had abandoned the countryside. Dreamers, by contrast, were to be found everywhere. I did like that there were many instances in this adventure story that felt magical and dream-like. Because Mr. Muo has studied dreams and psychoanalysis, Sijie used a stream-of-consciousness-like style and ethereal descriptions of everyday observances that made me feel like this was part magical realism, part modern fairy tale (a broomstick mistaken for a woman's ankle!?). There were instances that really did feel magical and for that, I commend Sijie. It was as if the setting of the novel was an enchanted version of our world. However about midway through the book this feeling wore off a bit and began to feel trite. The plot was meandering throughout, which is to be expected with a steam-of-consciousness-like style, but after awhile I wanted something more to happen. There are points of absurdity that had me laughing out loud, and a lot of Muo's analysis of dreams are humorous, but in the end I wanted the plot to move along and a resolution to surface. Sijie explores themes of eastern vs. western culture throughout the novel, which makes me question if I'm too stuck in my western ways to fully appreciate this eastern novel. That sounds a bit weird.. a virgin in exchange for his lover? I dislike magical realism so it doesn't look like a novel I'd be likely to pick up. Bummer you didn't enjoy it though. I'm feeling the same with The Sisters Brothers. I think this book sounds incredible, but I didn't enjoy Balzac & The Little Chinese Seamstress at all - I just couldn't connect with any of the characters. I think I'll probably give it a go.